We ended up washing the mushrooms with some water and finger grease (I just rubbed off anything that look questionable, with my finger). Then we placed them on a baking sheet to bake for 15-20 minutes at 375 degrees. I looked at some different recipes and some just had you put toppings on and warm up and some had you bake beforehand. We were glad we did bake them beforehand also so that when we went to eat the mushrooms they were soft and easy to eat. After you bake them for 15-20 minutes remove them from the oven and drain off any liquid. Then spread on tomato paste and sprinkle with desired Italian Seasonings. 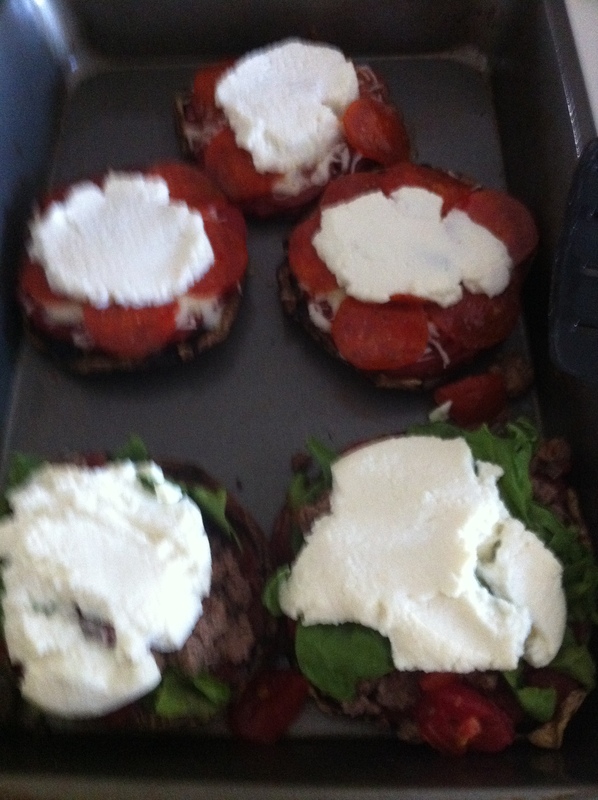 Add some cheese of choice (ricotta was mine) and the meat toppings. Sorry for the awful picture, I promise to start using my Canon Rebel instead of just snapping them with my iPhone! Bake for another 10-15 minutes or until everything is nice and melty warm. Posted in Gluten Free, Main Course, Recipe, Uncategorized and tagged gluten free main course, gluten free portobello mushroom pizza, gluten free recipe, gluten-free, Healthy, italian, Red Gold, Red Gold tomato paste, ricotta cheese. Bookmark the permalink.